Welcome back, my fledgling hackers! Sometimes, for a variety of reasons, we can only get a command shell on our target system. For instance, with Metasploit, it's not always possible to get the all powerful Meterpreter on our target system. In other cases, we may be able to connect to a command shell via Netcat or Cryptcat. In each of these cases, to control and own the target system, we may have to upload additional software. TFTP may be our answer! TFTP is a UDP/IP protocol that uses port 69. It is used to upload (GET) and download (PUT) files between computer systems without authentication. It operates on a client/server architecture. If we can install/use a TFTP server on our Kali system, then we can use it to upload hacking software to the target system from a command line. For instance, if we wanted to grab the password hashes and crack them, we would need to upload samdump2 and pwdump to the target system like in this tutorial. After grabbing the password hashes, we could then use TFTP to download the files to Kali for cracking offline. What Systems Have TFTP Clients? Nearly every OS has a TFTP client installed, but not always enabled. On Windows XP systems and earlier, the TFTP client is enabled by default. On Windows Vista systems and later, the TFTP client must be enabled through the control panel. System admins often enable it for administrative purposes and leave it enabled. Some Unix/Linux systems have it enabled by default as well. Many network switches and routers have TFTP enabled in order to upload and download new configuration files. When it is, we can upload and download software—at will—to the target system, if we have a TFTP server. Kali Linux, our hacking platform of choice, has the advanced TFTP (aTFTP) server installed by default. We can use it, thereby, to upload and download software to the target machine. In this tutorial, we will upload password cracking software to a Windows 2003 Server system with the TFTP client enabled. Once we have this software uploaded to the target, it will enable us to grab the password hashes that we can then download and crack. 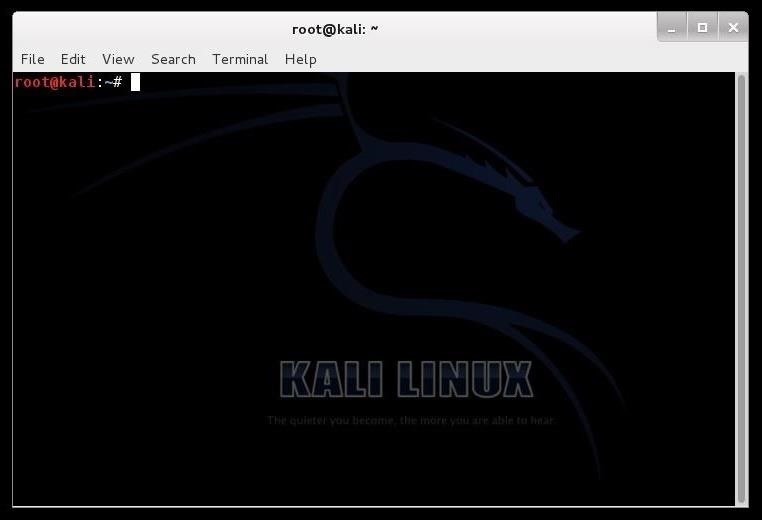 Let's start by firing up Kali and opening terminal like below. The first step is to start the aTFTP (atftpd) server. Then, create a directory we want to upload our malicious software from. Next, we need to edit the configuration file for atftpd. You can open it in any text editor, but here I will use Leafpad. Edit this text file as I have above. After editing the configuration file, save it. Now, we need to restart the aTFTP server to use the new configuration. Next, we need to copy our malicious software to the /tftpboot directory. First, navigate to the directory where the software resides. In this case, it's /usr/bin. Then, use the "cp" command to copy it to the /tftpboot directory. Now, we need to connect to the target machine we want to upload the software to. This might happen through getting a command shell using Metasploit, or other ways, but here I will be using Netcat. As you can see, we are connected to the Windows machine through a command shell provided by a Netcat listener on the target system. Now that we have our aTFTP server configured, our software in /tftpboot directory, and we are connected via Netcat, we can upload the malicious software to the Windows system. The TFTP syntax looks like that below. First, the TFTP command, then the -i switch, then the GET command (upload), the IP address where the TFTP server resides (Kali, in this case), and finally, the name of the file we want to upload from the TFTP server's default directory. As you can see, we were able to upload the samdump2 file to the target. When we check our target with a directory listing, we can see that the file is now on the target in the same directory as where we issued the TFTP command. Finally, do the same with the pwdump file. This will send the hashes.txt file to our /tftpboot directory where we can now run Hashcat or John the Ripper on the them to crack the password hashes. News: Samsung Keyboard Vulnerability Exposes 600M Mobile Devices! so if the tftp client is disabled then will this not work? Forgive me if this is a "dumb" question, but could one use this technique to enable a meterpreter session on the victims machine? Yes, you could upload the meterpreter payload, but you couldn't execute it. Do both computer need to be port forwarded? Hey do you know what I could use instead of samdump2 and pwdump to extract hashes from a Linux machine? I haven't found anything on the web and the tutorial on Linux password cracking does not cover grabbing the hashes from another system.